Trying to build a website without getting proper web hosting is like building a house without having a piece of land to build it on, it’s practically impossible. Whether you have a small website that is designed to cater towards the needs a few people or a major website that will bring in thousands each day, you need to have the best web hosting to accommodate it. Web hosting is where a lot of confusion and frustration stems from in the website making process. If you’re new to the idea of building your own website this can seem like most difficult task in the world. With so many different packages being offered at varying prices, it can be hard to discern what kind of hosting would be the best web hosting for you. The last decade in itself has brought over a huge uptick in entrepreneurship but has not brought much information in the area of managing personal resources and maintaining them. With such a vast pool of free information out there, it can be hard to separate the fact from the misconception. So many resources out there will purely mislead you or confuse you further. This can end up being a costly mistake and you could end up paying hundreds for a service that you simply don’t need. Thankfully, this guide will help you shine a light on what the best web hosting for your website can be. Before you can start choosing your web hosting provider, you have to know exactly what kind of necessities you require. There are a number of different features and aspects that you might want to focus on if you want to go ahead and pick a provider. It’s also helpful to know if you will be sticking to your needs for a long period of time or whether you might want to upgrade in the near future. Determining these needs will help you progress much further and much quicker towards setting up your website. Here are some of the most common needs you should focus on in order to find the best web hosting service. The first step towards selecting your web host before anything else is deciding what type of website you will be making. There are different types of sites that can be made with different methods and different requirements. The most common ones include HTML, Ghost, and WordPress. It’s crucial to know the type of website beforehand because you will be choosing the best web hosting based on the technical requirements of your preferred type. Things like coding languages and types of databases will all have to be dependent on this and you need to make sure that your web host can accurately facilitate them. Another crucial aspect that you will need to focus on is the amount of data that you will be adding to your site. The file size of your site will determine just how much you need to be able to put on the site itself. This figure will vary depending on what kind of content you wish to add to your site. For smaller sites that are text only, this figure will be very low and you can get away with having cheaper low capacity host. However, there are some larger sites that can include content such as high resolution images, high definition videos, flash animations, sound files, and downloadable files. Hosting these types of websites will really drive up your need for more storage which will come at a higher cost and can end up hurting you if you’re not careful. Make sure that you’re properly aware of what kind of content you will be hosting and estimate your capacity accordingly. It’s a good idea to overestimate this figure as you will need some space for system resources and software requirements as well. It’s an obvious fact that if you’re creating a website, you want people to visit it. However, it is important just how many people will actually visit it at any given time. A larger volume of traffic will put much more load on your hosting server. If the limit gets exceeded, your website might load painfully slow or might even run the risk of crashing the server altogether. To avoid issues like this, it is important to know what kind of traffic you will be expecting on an average day. It is always best to account for a larger traffic volume than the one you expect as practically things tend to go down a little differently. You will also need to properly account for any future traffic as well. Most of the time, the initial traffic is expected to be very low but can shoot up in a short amount of time. You need to be sure that your web host is full and ready for any major increase in site traffic so that you’re not unprepared. This will greatly impact your experience based on how much work will be involved in setting up your web site. Cheaper services will offer a barebones server where you may have to setup and install all the necessary operating system and required software. Other services will offer you a server with an OS all set up where you just have to focus on making your site. There are also premium services that help you with the creation of the actual website. These services will offer you a server that has already been mostly setup and just needs a few personalized touches. Things like templates can also be offered for your website that you’ll just have to add your content to. Choosing between these different services all depends on your technically proficiency, the time you’re able to spend, and the effort required. Make sure to only tackle something you can actually handle as it will save you a ton of hassle and money down the line. These two aspects will directly reflect the quality of service you can get from your web host provider. Building a website is not an easy task and its helpful to know that there will be some support should something go wrong. Different companies will offer their level of support for your website or any technical issues or errors. Some companies only offer support during a limited time of the day and require you to write a support ticket and wait for their response. Other services will offer you round the clock 24/7 support whether it’s in the form of text chat, voice support, or a combination of the two. This will ensure that you have something to fall back on if and when something goes wrong. Security is also a crucial requirement for making websites. You need to be certain that your content and data will be safe from any attacks that could damage your website in any way. You will also need to decide if you need added security if your website processes personal details such as name, phone numbers, addresses, or credit card and bank info. Additional security services will ensure that the private information of your visitors doesn’t end up being compromised under any circumstances. It’s tricky to be able to balance your budget and your requirements but it is something that needs to be done. Although you won’t need to know the exact amount when starting out, it’s a good idea to have rough estimate. This will heavily impact the type of hosting you will be using. Larger traffic websites will need a greater budget to sift through all the requirements whereas you can get away with smaller costs on smaller sites. Things like volume of data will also impact the cost and things like content an drive it up. If your monthly web hosting budget is flexible then you can opt for more premium features and extra services. Likewise, if your budget is extremely low then you will have to only focus on the bare essentials and forget about optional extras. The ideal situation is to effectively balance your cost with your requirements and focus on features at the very end. This will ensure that you get the best web hosting for the price you want. In terms of your priorities, this is the absolute last thing you should focus on. Ideally, you should be using features as a way to choose between two similarly priced web hosts offering similar services. Some features are provided free of cost while others may cost a nominal fee to add on to your existing purchase. These features can be as simple as a domain email address or as complex as having multiple sub domains on the same server. Some premium services will also offer to backup your site data periodically and give you the ability to copy it somewhere else. Some web hosts will even offer consultation services on building and managing your website to its full potential. These features can end up being really helpful but aren’t a strict requirement. If you can afford to have them, then go for it. Otherwise don’t go over budget for something that you may not even use. Once you have your needs and requirements all sorted out, the next step is to find a service that will fulfill them. There are hundreds of web hosting services out there with varying levels of quality. Some might allow you to make your website affordably while others will offer you ease of service. It’s important to compare these different services so you can get the best web hosting for your website. It’s crucial that you do your own research because what might be the best web hosting for you might not be the best hosting for someone else. 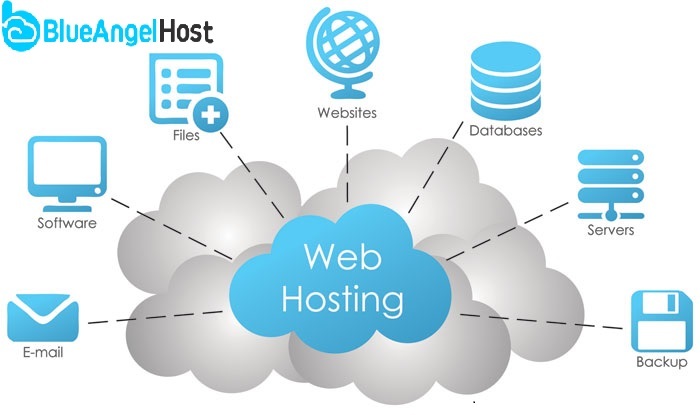 With that in mind, here are the most common types of web hosting services. This is an extremely common type of web hosting that is used for smaller sites like blogs and personal project websites. The way shared hosting works is that you have server that is shared with multiple users and you’re allocated a portion of the server. This type of web hosting is very affordable and can be great for a first timer. Shared hosting also has very little maintenance required and you can even upgrade them with relative ease. The only drawback is that the server can only handle a low amount of server traffic. VPS Hosting is very similar to shared hosting but with a few changes. You’re allowed to use a portion of the server that is shared by everyone else. However, the difference between a shared host and a VPS host is that your partition is completely separated from other users. This means that your data isn’t all in the same place as other people, giving you much more security. VPS hosting also gives you extras such as admin access which you can then use to scale up your website and fully customize it however you want. VPS hosting will cost a bit more than shared hosting and is perfect for medium sized websites that need full customization. This is by far the most flexible and most expensive type of web hosting that you can get. This type of hosting will provide you with your personal server that you can use as you wish. There is no sharing of the server with any other users and you have the server all to yourself. This makes sure that your data is secure and safe. Things like data capacity and traffic volume is increased too giving you the ability to add more to your site. Another thing that’s great about dedicated hosting is that you have complete control over the server to choose things like the operating system and the programs. This type of hosting is best for large websites that can afford premium services.